We’re always looking for Blackpool Pleasure Tips & Tricks to help you make the most of your visit and this cheap ticket offer ticks all the boxes. Here’s a chance to enjoy online savings of up to 28% off walk up prices when you book online in advance. This Attractiontix deal includes entry the Pleasure Beach, Nickelodeon Land & a wristband for the rides with tickets priced from just £28pp, (£26pp for children 11 years & under). Promotions vary throughout the season so look out what’s running on the date of your visit. TO BOOK TICKETS GO TO Blackpool Pleasure Beach Cheap Ticket Offers. 2. Blackpool Resort Pass; 6 Attractions from £55pp! The Blackpool Resort Pass offers 1 entry all of the following attractions; Blackpool Pleasure Beach/Nickelodeon Land, (ride wristband included), Blackpool Tower, Blackpool Tower Dungeon, Sea Life Blackpool & Madame Tussauds Blackpool. Tickets are priced at £55p and are valid for 7 days from the date you exchange your e-voucher. For those planning a few days to Blackpool this can offer value for money for those looking to see the sights plus add another 3 attractions for just £25pp! More details available at Blackpool Resort Pass. Upload your expenditure up front with this combined ticket & meal deal offer for just £34 an adult/£28.50 a child, (under 12 years). This joint package from Attractiontix offers up to 22% off walk up prices and provides entry & wristband to Blackpool Pleasure Beach plus an all-you-can-eat pizza, pasta & salad buffet including a soft drink. More information available at Blackpool Pleasure Beach Tik’s & Meal Deal. Tesco shoppers can take advantage of a cheap day out at Blackpool Pleasure Beach by using their clubcard reward vouchers. Opt to either buy in full or take advantage of the part-pay option where you can top up with cash. Simply redeem your clubcard vouchers in advance of your visit and present at the ticket kiosks on the day of your visit. LOOK OUT FOR OUR Blackpool Pleasure Beach Guide packed with tips & tricks to help you get the most from your visit! 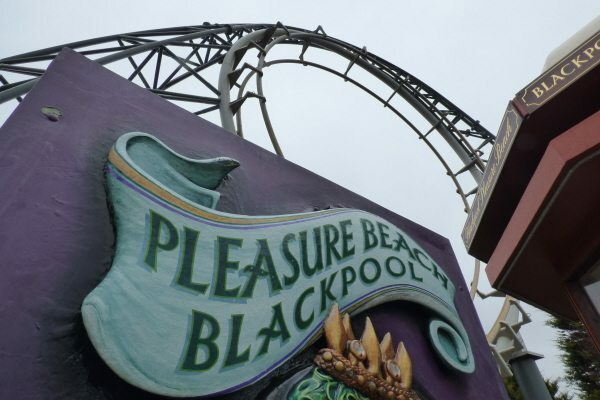 Blackpool Pleasure Beach offers a FREE return visit if it rains continuously for 3 hours or more during your visit. Your return visit must be taken the next day where you will need to present both your till receipt and your wristband, (that must remain on your wrist), to pick up a like-for-like FREE wristband. Alternatively if you can’t visit the next day, you do have the option of securing half price wristbands later in the season, (Sundays only), if you hold onto your wristband & till receipt. A great way to insure against the bad weather although the continuous rain stipulation is longer at Blackpool that we’ve seen elsewhere. More information on Rainy Day Guarantees; Worth It? The great advantage at Blackpool Pleasure Beach Pass is that for those that prefer not to ride there is reduced priced ticket just for you. The Blackpool Pleasure Beach Pass, (priced around £6pp), is particularly effective for those who want to accompany children into the park rather than access the rides. Even better news is if you change your mind, you can always pay for an individual ride or upgrade to an unlimited ride ticket from within the park. Worth noting that their are height restrictions in place with Nickelodeon Land so you may find yourself needing to accompany younger children and thus requiring a token/wristband. In previous years, we’ve seen substantial discounts on BPB season passes for the following year that can offer value for money for those planning to visit frequently. These tend to go live around October time each year so we’ll bring you more details as they come in. Find out more details about New Coaster ICON at Blackpool Pleasure Beach that plans to open in 2018! Valid Blue Peter Badgeholders can pick up FREE entry to Blackpool Pleasure Beach when accompanied by a full paying adult. Badgeholders must be aged between 6 & 15 years and present their Blue Peter badge & badge card at the ticket kiosk on the day of your visit. More information available at Blue Peter Badge Offer. In previous years Blackpool Pleasure Beach offered discounted Nickelodeon Land only wristbands for around £19pp. Whilst we haven’t seen this offer running for some time, we’ll bring you further details if it runs again in the future. BPB often runs special deals at short notice, offering reduce price wristbands with specific promotional codes so keep checking back for all the latest Blackpool Pleasure Beach 2 for 1 deals. It can be worth signing up to their website to receive emails alerting you to ongoing ticket offers. Find out about Speedy Passes at Blackpool Pleasure Beach that helps you to bypass the queues at this popular theme park! This entry was posted on Thursday, February 1st, 2018 at 12:12 pm	and is filed under . You can follow any responses to this entry through the RSS 2.0 feed. You can leave a response, or trackback from your own site. Hi taking 3 boys tomorrow for my son’s 13th birthday. Should I pay for VIP Plus tickets in advance – if so how do I do that? Hi Fiona, I think you’ve probably been & gone by now but it really does depend of how busy it is at the park on the day of your visit. It can be worth waiting until the day you visit to assess queue times at the park before investing in VIP Plus Tickets for Blackpool Pleasure Beach as that can very quickly ramp up your costs on a day out. You can purchase queue busting fastracks from the ticket box office that is found close to the main BPB entrance once you are in the park. Hi David, is your query regarding the Blackpool Resort Pass? This pass includes entry to the Pleasure Beach, Blackpool Tower, Blackpool Dungeon, Sea Life & Madame Tussauds London that is priced at £55pp and is valid for use over a 6 day period. This pass tends to booked in advance or there is the option to pay on the day from the VisitBlackpool Tourist Information Centre but there is an additional charge of £5 per pass for use on the same day. I can’t see anything specifically if you were looking to visit Blackpool Pleasure Beach over six days so you are perhaps best contacting Blackpool Pleasure Beach directly if this is something you are looking to do. Travelling to Blackpool next Friday 12th Aug. Looking for best deal for Pleasure Beach for 5 adults and 2 under 11s. Are there any discounts going, say bogof or 2 for 1 offers. Hi Dympna, there is a cheap ticket offer for Blackpool Pleasure Beach running through Attractiontix that’s worth taking a look at. 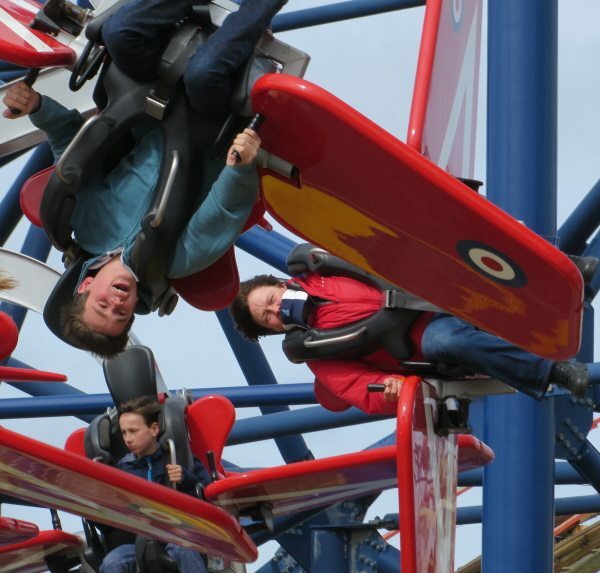 You don’t tend to find many 2 for 1 vouchers for the Pleasure Beach although can be worth signing up for BPB’s newsletter as they often send out discounted promo codes at select times of the year. Hi Nadine, to be honest I cannot see any particular local resident offers for Blackpool Pleasure Beach running on that date. Perhaps worth checking local press for any offers directed at local residents or contacting the pleasure beach directly. Often any local resident discounts are limited to those with a FY or PR postcode. Hi Julie, I can’t see any information yet for the 2016 Blackpool Pleasure Beach season passes. In previous years, they have tended to run promotions towards the end of one year for the next theme park passes so worth keeping an eye out for these. Hi Zara, Blackpool Pleasure Beach used to do a Nickelodeon only wristband but unfortunately they don’t seem to offer this anymore:( BPB are currently offer further online discounts, (Junior wristband from £18pp), for those that can book 10 days or more in advance so worth checking out the online prices directly with Blackpool Pleasure Beach. Always worth signing up to their newsletter as they tend to offer promo codes during the season. Hi Angela, often the best price tickets for Blackpool Pleasure Beach are for those that can book in advance, (10 days or more), directly with the Pleasure Beach. Alternatively you can exchange clubcard vouchers for tokens that are valid at BPB or take a look at the Blackpool Resort Pass that offers discounted entry to a number of Blackpool attractions. Worth keeping an eye out for any promo codes on wristbands that BPB send out from time to time when you sign up to their mailing list. Hi Michelle, I can see very many deals available for Blackpool Pleasure Beach on your selected date. There are online offers available if you book in advance at Blackpool Pleasure Beach. Alternatively you can exchange clubcard vouchers for tokens that are valid at BPB or take a look at the Blackpool Resort Pass that offers discounted entry to a number of Blackpool attractions. is there any deals for June 18th? Hi Andy, I am not aware of any Blackpool Pleasure Beach deals that are specifically running at that time. The Pleasure Beach tends to run promotions on a month by month basis where many of the best ticket deals are run directly with BPB so worth keep an eye on upcoming deals. Hey, can ya’ll give me some information, on how much tickets would be for a family of 4, with the cheapest hotel deals that is fairly close to the amusement park? I’d really appreciate this information as me and my family are planning a trip to Chessington in the summer holidays (preferably 18th of July). Hi Dilruba, you can find more information on cheap tickets deals for Chessington over at Deals for Chessington World of Adventures. The closest hotels are on-site and you can pick up packages that include tickets & accommodation. There is also a Premier Inn that is located directly below the Chessington Park. Hi Elaine, Nickelodean Land is located within Blackpool Pleasure Beach and is included within the eligible rides & attractions on the wristband. As with all rides there are some height restrictions and some require children to be accompanied by an adult. Hi Barry, the dates have yet to be listed on the BPB’s website, (we are independent of the Pleasure Beach), so I suspect that they have yet to be confirmed for 2015. Hi any offers for Blackpool pleasure beach in October please for 2 adults and 4 children thanks . Hi Tracy, I am not aware of any specific deals for Blackpool Pleasure Beach for October at the moment. Often BPB run short notice offers to those that have signed up or their email newsletter or take advantage of their online booking discounts or redeem tesco clubcard vouchers for entry tokens. Nothing specifically for the 19 August. Often the best online discounts for Blackpool Pleasure Beach are for those that can book 10 days in advance. Another option would be to use clubcard vouchers or invest in a Blackpool Resort Pass if you are planning to visit a number of Blackpool attractions. Hi..im planing to take my 2 granddaughters to the pleasure beach on the 17th oct..do u know if they are doing 2 for 1 on the passes? Hi Anne, I’ve not seem so many 2 for 1 vouchers running at Blackpool Pleasure Beach this season although that’s not to say that might not be some towards the end of the season. At the moment, the cheaper wristband price tends to be when booking in advance & online but worth signing up for BPB newsletter as they often send out promo codes at short notice for select weekends. Hi Ben, I’m not aware of any particularly offers running for August at the moment. If you are considering booking online then the earlier you book the greater the savings you will make so one to consider. You can also redeem clubcard vouchers for tokens that can be used at BPB. For anyone not looking to experience the rides, then a Blackpool Pleasure Beach Pass will gain you entry to the park but not the rides, (priced at around £6pp). Hi Mary, unfortunately not that I am aware of:( Blackpool Pleasure Beach often send out promo codes from their mailing list for specific days/weekends during the season so could be worth signing up for that. You can also redeem clubcard vouchers for BPB tokens or if you can book 10 days or more in advance, there are online discounts that you can take advantage of. Hi Sarah, I would be surprised if Blackpool Pleasure Beach is open until midnight on 8 November….I can see that it does currently state that on the opening times but I wonder if this is an error? Topdogdays is independent of BPB so best to contact the Pleasure Beach directly. Hi, I am going to a caravan site on the outskirts of Blackpool with my granddaughter on Fri 4th July 14 till Mon 7th July 14 & we would love to go to pleasure beach for the day on Sunday 6th, is there any deals on the wrist bands for that day. thanks. Hi Margaret, it is not always clear at Blackpool Pleasure Beach whether to take advantage of their early bird offer, (currently if you purchase BPB tickets online at least 10 days in advance, you can take advantage of online discounts) or wait to see if a last minute deal comes up for the date you are looking for, (BPB sometimes run promo codes that they send out to those that have signed up for news directly with the Pleasure Beach). Alternatively you could look at redeeming tesco clubcard vouchers or invest in a Blackpool Resort Pass that offers discounted entry to a number of Blackpool attractions. thank you for your rapid reply, I will look out for deals & hope something turns up as we cant take advantage of the 10 days in advance deal as our holiday starts on Friday. many thanks. Hi Derek, if the adults are not looking to use the rides at Blackpool Pleasure, you are best purchasing Blackpool Pleasure Beach Passes that offers you entry into the Pleasure Beach but no access to the rides. Blackpool Pleasure Beach Passes are currently priced at £6 per day, (you can book online or pay at the gate). During October, wristbands (that gives you access to the Pleasure Beach as well as the rides) are priced at £23 per adult/child when purchased online. If you are a regular Tesco shopper, you could consider redeeming clubcard vouchers for BLackpool Pleasure Beach tokens for the children, (currently £9.50 in clubcard vouchers). Sorry, I am not aware of any Blackpool Tower deals. Hi Claire, Blackpool Pleasure Beach tend to run new promotions at the beginning of each month…the current promotion for September is £20 wristbands but clearly this won’t work for you! I can see the current online price for 4 October is £23 a wristband so worth keeping an eye on their online prices. Sorry Sharon…it is £20 online if you book in advance for 29 September. If you pay on the gate at Blackpool Pleasure Beach, it will be £29.99 per person. Hi Sharon, I’m not too familiar with the Tesco petrol 2 for 1 vouchers…weren’t they for Merlin Attractions? Best check the terms & conditions on the voucher for this promotion for valid visitor attractions & dates for use. In general terms, a 2 for 1 voucher only works when accompanied by a full paying person, (generally an adult), and you cannot take advantage of any other offer, concession or discounted ticket including online ticket offers. 2 for 1’s tend to work only when paying on the gate prices so you will need to work out what offers you best value for money…using a 2 for 1 voucher or purchasing discounted tickets online for Blackpool Pleasure Beach. Hi Michelle, the best online deal I can see is £20 per adult/child. This price is valid if you book, in advance & online, at Blackpool Pleasure Beach. Another option is redeeming Tesco Clubcard Vouchers for Blackpool Pleasure Beach entry tokens. Hi Roy, Blackpool Pleasure Beach have run promotions during the year offering free entry, (of course, you still need to pay for the rides) into the park so worth checking back regularly to see what offers are running. Whilst I can appreciate that admission charges can mount up, at least the Pleasure Beach offers entry for just £6 per person as most other theme parks would charge you the full admission charge regardless of whether you are looking to use the rides or not. Unfortunately, I am not aware of any senior or Grandparent discounts currently running for Blackpool Pleasure Beach at this time. Can you improve your deal for 2 adults and 1 11yr old, total £59.98, if so please email me with your deal as we are trying to decide which park to go to before end of November. Hi Dave, Topdogdays is independent of Blackpool Pleasure Beach & simply signposts you to current deals & discounted ticket offers running. BPB tends to vary the deals running each month, so worth checking back so what offers are running nearer the time. 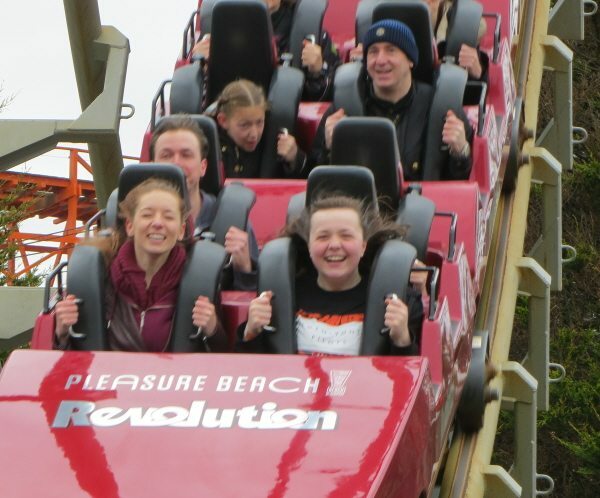 Hi Lewis, Blackpool Pleasure Beach tend to run a new promotion each month so it might be worth waiting until a little closer to the time to see what promotions are running for the end of the season. Are there any deals for carers? Hi Trisha, you can find more information over at Blackpool Pleasure Beach on Guests with Disabilities. Danielle, the Blackpool resort pass plus offers 1 entry to all of the following Blackpool attractions; Blackpool Pleasure beach, Blackpool Tower Eye, Blackpool Dungeons, Sea Life Centre in Blackpool, Madame Tussauds Blackpool, Blackpool Zoo Sandcastle Waterpark & Blackpool Model Village. Each pass is priced at £77.50 per person and is valid for seven days from your selected visit date or date of purchase from the VisitBlackpool Tourist Information Centre. Currently a Pleasure Beach Pass is priced at £6 per person. However, if you are purchasing wristbands for Blackpool Pleasure Beach, you do not need a Pleasure Beach Pass as the wristband will secure you entry to the park. Wristband prices change all the time but currently, (July 2013), if you purchase online you can pick up a Blackpool Pleasure Beach wristband for £24 per person. Hi Kim, the wristband online price at Blackpool Pleasure Beach often changes from month to month depending upon the promotion currently running. You can always purchase wristbands on the gate but you will generally be paying more than if you purchase wristbands online. I can see today, (15 July 2013), 2 Summer Saver Wristbands for 20 August are priced at £22.50 each. These include Nickelodeon Land & other rides at the pleasure beach. Hi Tracy, the online price of the wristbands changes from month to month depending upon what promotion they have running. For July, if you book in advance you can pick up a wristband for £24 per adult/child. The on the gate price is always more expensive so worth checking out any online offers or if there are any vouchers available for Blackpool Pleasure Beach, (no vouchers available at the moment that we can see). Hi Tracy, during July the adult & child wristband prices for Blackpool Pleasure Beach wristbands are the same price, (£24 per person). At different times of the year, BPB differentiate between adults & children wristbands but as a child is deemed as 11 years or under, your 12 year old would still need to pay the adult price…mad I know. No information as yet for promo codes for July at Blackpool Pleasure Beach but do keep checking back for the latest information. Hiya, was wondering if you’ve any information about any promo codes for Blackpool Pleasure Beach, im meant to be going on the first of July and a 2-for-1 deal would be perfect! Hi please help , cannot find anywhere on the Internet about prices of ride tickets for bpb in particular nickelodeon land as don’t want to but a wristband as only going on 3 or 4 rides in turn with me and my child then my wife on a ride with the child ? Also will he using the free entry offer but is that for only 1 person or can it be used for more. Great thinking….you can use the promo code online to pick up your Free Pleasure Beach Passes, (you can have more than 1), then purchase ride tokens on the day. Tokens range from £2-£8 a ride. In Nickelodeon Land the tokens are priced around £2-£5 per person but do take account of height requirements that may require an adult to accompany the children. The higher end £8 a ride tokens are for the thrill rides such as Pepsi Max. Hi Andrew if you are thinking of visiting in June, you can take advantage of a £2 parking charge for 24 hours parking. This is available at South, Central Beach Londsdale Road & Central coach car parks with 2000 spaces for vehicles available at this reduced priced rate. Hi Michael, Nickelodeon Land is part of the Blackpool Pleasure Beach and particularly of interest to younger customers. 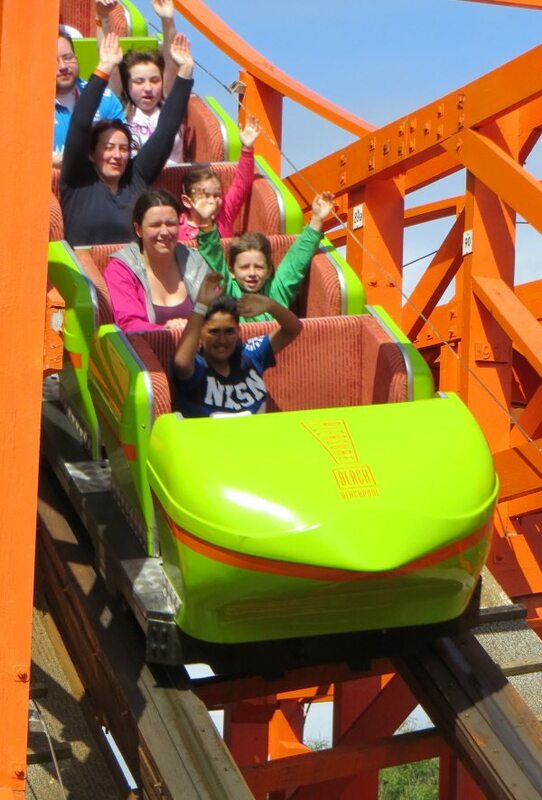 You can therefore either make use of some of the deals listed for the Blackpool Pleasure Beach, (3 for 2 vouchers, Blackpool Resort Pass, clubcard vouchers etc), or take advantage of the Nickelodeon Land reduced price wristbands for just £18 per person. Be aware of minimum height restrictions on these rides but if your child does not need accompanying on the rides, you could take advantage of a £5 Pleasure Beach Pass. Our guide to picnics at Blackpool Pleasure Beach with information on lockers, allowed drinks & snack and other options. Find out more details about ICON - the world's first double-launch coaster under construction at BPB. Our guide to cheap tickets and top tips for this popular attraction located close to the Blackpool Tower. Check out our Blackpool Pleasure Beach Guide to Beat the Queues & Money Saving Tips.